I'm a massive fan of all things nail related! So as I was out at Superdrug the other day buying my weekly dose of polishes I came across more of the Barry M nail polishes! I absolutely love them so when I saw that the Gelly Hi-shine polishes were back in stock I had to buy them! The range they have in stock is amazing, full of so many different colours I couldn't decide which ones I wanted! So I went for a more natural/tan and the every obvious baby pink shade! I can pretty much say I'm in love with both of them! 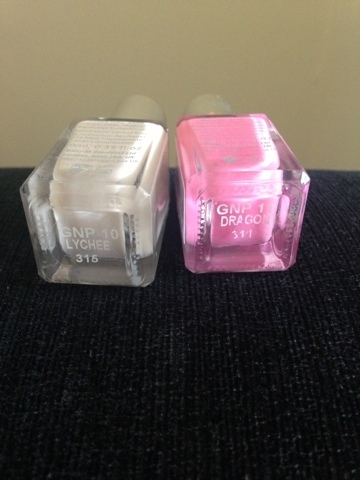 I thought I'd try out the shade 'Lychee' (on the left). When I first put the 1st colour on I really liked it but I do like a solid colour so I always end up putting 2 colours on. It dries like any other nail polish but something about the gelly hi-shine it gives off a shiny and jelly like finish (hence the name). I was also quite shocked with how long it lasted on the nails! I tend to change my nail colour every week depending on my mood and by the end of the week the colour has all chipped off and it looks awful but whenever I use the gelly hi-shine it always stays in really good shape, I'm really impressed! I *love* the Gelly polishes too! I tend towards the deeper shades but the lychee looks cute. Try Barry M 3-in-1 base and top coat under and over your colour - I quite often find now that my nail polish hasn't chipped at all when I come to take it off a week later! It's been a revelation to me!